The Department of Posts (DoP), trading as India Post, is a government-operated postal system in India. Generally referred to within India as "the post office", it is the most widely distributed postal system in the world. The postal service is under the Department of Posts, which is part of the Ministry of Communications and Information Technology of the Government of India. As of 31 March 2015, the Indian Postal Service had 154,939 post offices, of which 139,222 (89.86%) were in rural areas and 15,826 (10.14%) in urban areas. It had 25,560 departmental Post Offices and 129,379 Gramin Dak Sevak, Branch Post Offices. On average, a post office serves an area of 21.22 square kilometres (8.19 sq mi) and a population of 8,054. 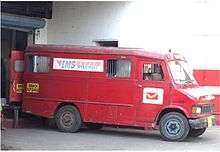 Because of its reach and presence in remote areas, the Indian postal service is also involved in other services such as small-savings banking and financial services. The country has been divided into 22 postal circles, each circle headed by a Chief Postmaster General. Each circle is divided into regions, headed by a Postmaster General and comprising field units known as Divisions. These divisions are further divided into subdivisions. In addition to the 22 circles, there is a base circle to provide postal services to the Armed Forces of India headed by a Director General. The highest post office in the world is in Hikkim, Himachal Pradesh operated by India Post at a height of 15,500 ft (4,700 m). The British Raj was instituted in 1858, when the rule of the East India Company was transferred to the Crown. By 1861, there were 889 post offices handling nearly 43 million letters and over 4.5 million newspapers annually. The first superintendent of the post office was appointed in 1870 and based in Allahabad and in 1876, British India became the first non-founding member of the General Postal Union. The Government Savings Bank Act 1873 (5 of 1873), passed by the legislature 28 January 1873, was enacted in 1881. On 1 April 1882, Post Office Savings Banks opened throughout India (except in the Bombay Presidency). In Madras Presidency, it was limited; in the Bengal Presidency, no POSBs were established in Calcutta or Howrah. Postal life insurance began on 1 February 1884 as a welfare measure for the employees of the Posts & Telegraphs Department as Government of India dispatch No. 299 dated 18 October 1882 to the Secretary of State. The Indian Post Office Act 1898 (6 of 1898), passed by the legislature on 22 March 1898, became effective on 1 July 1898 regulating postal service. It was preceded by Act III of 1882 and Act XVI of 1896. The world's first official airmail flight took place in India on 18 February 1911, a journey of 18 kilometres (11 mi) lasting 27 minutes. Henri Pequet, a French pilot, carried about 15 kilograms (33 lb) of mail (approximately 6,000 letters and cards) across the Ganges from Allahabad to Naini; included in the airmail was a letter to King George V of the United Kingdom. India Post inaugurated a floating post office in August 2011 at Dal Lake in Srinagar, Kashmir. Telegraphy and telephony made their appearance as part of the postal service before becoming separate departments. The Posts and Telegraphs Departments merged in 1914, dividing on 1 January 1985. Since Indian independence in 1947, the postal service continues to function on a nationwide basis, providing a variety of services. The structure of the organization has the directorate at its apex; below it are circle offices, regional offices, the superintendent's offices, head post offices, sub-post offices and branch offices. In April 1959, the Indian Postal Department adopted the motto "Service before Self"; it revised its logo in September 2008. The first adhesive postage stamps in Asia were issued in the Indian district of Scinde in July 1852 by Bartle Frere, chief commissioner of the region. Frere was an admirer of Rowland Hill, the English postal reformer who had introduced the Penny Post. The Scinde stamps became known as "Scinde Dawks"; "Dawk" is the Anglicised spelling of the Hindustani word Dak or ("post"). These stamps, with a value of 1⁄2-anna, were in use until June 1866. The first all-India stamps were issued on 1 October 1854. The volume of mail moved by the postal system increased significantly, doubling between 1854 and 1866 and doubling again by 1871. The Post Office Act XIV introduced reforms by 1 May 1866 to correct some of the more obvious postal-system deficiencies and abuses. Postal-service efficiencies were also introduced. In 1863, lower rates were set for "steamer" mail to Europe at (six annas, eight pies for a 1⁄2-ounce letter). Lower rates were also introduced for inland mail. New regulations removed special postal privileges enjoyed by officials of the East India Company. Stamps for official use were prepared and carefully accounted for, to combat abuses by officials. In 1854 Spain had printed special stamps for official communications, but in 1866 India was the first country to adopt the expedient of overprinting "Service" on postage stamps and "Service Postage" on revenue stamps. This innovation was later widely adopted by other countries. Shortages developed, so stamps also had to be improvised. Some "Service Postage" overprinted rarities resulted from abrupt changes in postal regulations. New designs for the four-anna and six-anna-eight-pie stamps were issued in 1866. Nevertheless, there was a shortage of stamps to meet the new rates. Provisional six-anna stamps were improvised by cutting the top and bottom from a current foreign-bill revenue stamp and overprinting "Postage". India was the first country in the Commonwealth to issue airmail stamps. India attained independence on 15 August 1947. Thereafter, the Indian Posts and Telegraph Department embarked on a broad-based policy for the issuance of stamps. The first new stamp was issued by independent India on 21 November 1947. It depicts the Indian flag with the patriots' slogan, Jai Hind ("long live India"), at the top right-hand corner. The stamp was valued at three and one-half annas. A memorial to Mahatma Gandhi was issued 15 August 1948 on the first anniversary of independence. One year later a definitive series appeared, depicting India's broad cultural heritage (primarily Hindu, Buddhist, Muslim, Sikh and Jain temples, sculptures, monuments and fortresses). A subsequent issue commemorated the beginning of the Republic of India on 26 January 1950. Definitives included a technology-and-development theme in 1955, a series depicting a map of India in 1957 (denominated in naya paisa—decimal currency) and a 1965 series with a wide variety of images. The old inscription "India Postage" was replaced in 1962 with "भारत INDIA", although three stamps (issued from December 1962 to January 1963) carried the earlier inscription. India has printed stamps and postal stationery for other countries, mostly neighbours. Countries which have had stamps printed in India include Burma (before independence), Nepal, Bangladesh, Bhutan, Portugal and Ethiopia. The country has issued definitive and commemorative stamps. Six definitive series on India's heritage and progress in a number of fields have been issued. The seventh series, with a theme of science and technology, began in 1986. Between independence and 1983, 770 stamps were issued. The following table shows income generated by the postal department. The Postal Index Number (PIN, or PIN code) is a six-digit code of post-office numbering introduced on 15 August 1972. There are nine PIN regions in the country; the first eight are geographical regions, and the ninth is reserved for the Army Postal Service. The first digit indicates the region. The first two digits indicate the sub-region (or postal circle). The first three digits indicate a sorting district. The last three digits indicate the delivery post office. The PIN for an address may be found on the Postal Service website. There are total of 19,101 PIN codes covering 154,725 Post Offices in India, with the exception of the Army Postal Service as of 2014. Project Arrow was launched in April 2008. The project plans to upgrade post offices in urban and rural areas, improving service and appearance into a vibrant and responsive organization and to make a visible and positive difference.The project aims to create an effective, friendly environment for staff and customers, providing secure IT services and improving mail delivery, remittances (electronic and manual) and postal-savings plans. Core areas for improvement are branding, information technology, human resources and infrastructure. The project to improve service has been implemented in more than 23,500 post offices, and 'Look & Feel ' improvements have been made in 2,940 post offices. The Department of Posts received the Prime Minister’s Award for Excellence in Public Administration during 2008–09 for "Project Arrow – Transforming India Post" on 21 April 2010. Multipurpose counter machines with computers were introduced in post offices in 1991 to improve customer service and increase staff productivity. 25,000 departmental post offices out of 25,464 were computerized between as of 2011–2012. In 2012, a plan costing ₹1,877.2 crore (US$280 million) was formulated to computerize rural post offices. A ₹4,909 crore (US$730 million) project for computerization and networking of 1.55 lakh post offices across the country is being currently implemented by the government. Telecom Minister Ravi Shankar Prasad said the project involves a central server enabled integrated, modular and scalable solution for all operations of the Department of Posts including Core Banking and Insurance solutions in all departmental post offices. The first philatelic Society in India was founded in Bombay on 6 March 1897 to service postage-stamp collections. Function include design, printing and distribution of special or commemorative postage stamps, definitive postage stamps and items of postal stationery, promotion of philately, conduct of philatelic examinations at the national level, participation in international exhibitions and monitoring exhibitions at the state, regional and district levels and maintenance of the National Philatelic Museum. Philatelic bureaus were established in head post offices located at circle headquarters and at district-capital head post offices (as necessary). There are 68 philately bureaus and 1111 philatelic counters, including all head post offices (Mukhya Dak Ghars) in the country as of 31 March 2011.:44 A domestic philatelic deposit-account system was introduced on 1 August 1965 at all philatelic bureaus. Customers are given priority in purchasing commemorative or special-issue stamps, first-day covers and information sheets soon after their issue by opening a deposit account at any philatelic bureau. The number of philately deposit-accountholders grew from 23,905 in 1999–2000 to 168,282 in 2006–2007 and 183,202 in 2008–2009. Four philatelic Bureaus—the Bombay, Madras, Calcutta and Parliament Street, New Delhi GPOs are authorized to sell United Nations stamps. A quarterly philatelic magazine, Philapost, was launched in 2008. The Department of Post has also developed software for philatelic inventory management, known as "Philsim". It is used for all activities relating to philately, including forecasting, indenting, invoicing, monitoring supply and demand and recording sales and revenue for commemorative stamps and other philatelic products at philately bureaus and counters (and definitive stamps and stationery at circle stamp depots and head post offices). The National Philatelic Museum of India was inaugurated on 6 July 1968 in New Delhi. It had its beginnings at a meeting of the Philatelic Advisory Committee on 18 September 1962. Besides a large collection of India Postage stamps designed, printed and issued, it has a large collection of Indian states (confederate and feudatory), early essays, proofs and colour trials, a collection of Indian stamps used abroad, early Indian postcards, postal stationery and thematic collections. The museum was renovated in 2009 with more exhibits, a philatelic bureau and postal objects (such as Victorian post boxes). The Department of Posts inaugurated the National Philatelic Museum on 11 July 2011. It exhibits rare postage stamps from around the world and provides a venue for philatelists to exhibit their collections. The Army Postal Service (APS), functions as a government-operated military mail system in India. A primary feature of Army Postal Service systems is that normally they are subsidized to ensure that military mail posted between duty stations abroad and the home country (or vice versa) does not cost the sender any more than normal domestic mail traffic. 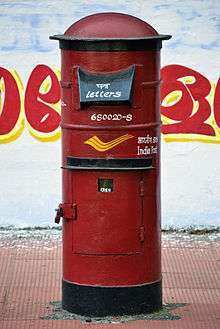 In some cases, Indian military personnel in a combat zone may post letters and/or packages to the home country for free, while in others, senders located in a specific overseas area may send military mail to another military recipient, also located in the same overseas area, without charge. The Electronic Indian Postal Order (e-IPO) was introduced on 22 March 2013, initially only for citizens living abroad. The postal orders can be used for online payment of fees for access to information under the RTI Act of 2005. The service was expanded to include all Indian citizens on 14 February 2014. Postal Life Insurance (PLI) was introduced on 1 February 1884 with the express approval of the Secretary of State (for India) to Her Majesty, the Queen Empress of India. It was essentially a welfare scheme for the benefit of Postal employees in 1884 and later extended to the employees of Telegraph Department in 1888. In 1894, PLI extended insurance cover to female employees of P & T Department at a time when no other insurance company covered female lives. It is the oldest life insurer in this country. There was over 6.4 million policies active as on 31 March 2015 with a sum assured of ₹130,745 crore (US$19 billion). Premium income of PLI for the year 2014-15 was ₹6,053.2 crore (US$900 million). It covers employees of Central and State Governments, Central and State Public Sector Undertakings, Universities, Government aided Educational Institutions, Nationalized Banks, Local bodies, autonomous bodies, joint ventures having a minimum of 10% Govt./PSU stake, credit co-operative societies etc. and staff of the Defence services and Para-Military forces. Apart from single insurance policies, Postal Life Insurance also manages a Group Insurance scheme for the Extra Departmental Employees (Gramin Dak Sevaks) of the Department of Posts. It was extended to all rural residents on 24 March 1995. Policies for government employees include Santhosh (endowment assurance), Suraksha (whole-life assurance), Suvidha (convertible whole-life assurance), Sumangal (anticipated endowment policy) and Yugal Suraksha (joint life endowment assurance). Policies for general public include Gram Santosh (endowment assurance), Gram Suraksha (whole-life assurance), Gram Suvidha (convertible whole-life assurance), Gram Sumangal (anticipated endowment assurance) and Gram Priya. The post office offers a number of savings plans, including National Savings Certificates, the Public Provident Fund, savings-bank accounts, monthly-income plans, senior-citizens' savings plans and time-deposit accounts. In 2013 it was revealed that the Indian postal service had formulated plans to enter the banking industry after RBI guidelines for the issuance of new banking licenses were released. Eventually they are planning to open a Post Bank of India, an independent banking service. In August 2015, the Reserve Bank of India had granted in-principle approval to 11 applicants to set up payments banks, including India Post. As of 29 February 2016, 18,231 post offices are utilizing Core Banking Solutions (CBS). ATMs are installed at 576 Post office locations. Core Insurance Solution (CIS) for PLI is rolled out in 808 head post offices and corresponding sub offices. A collaboration between the Ministry of Statistics and Programme Implementation (MOS&PI) and the Department of Posts has enabled the computation of consumer-price indices for rural areas. These statistics were previously unobtainable, due to problems of remoteness and scale. The agreement authorises the postal service to collect data on prices paid for selected consumer goods. In February 2011, MOS&PI published its first Rural Consumer Price Index and All-India Consumer Price Index. The information has since been published monthly, based on data available from 1,181 villages across the country. The boom in e-commerce and the surging number of cash-on-delivery consignments has led India Post to partner with major e-commerce portals for delivering pre-paid as well as Cash On Delivery (COD) parcels. The deliveries are primarily directed at tier-II towns, and parts of the rural heartland, where India Post has unparalleled reach. It has also has set up 57 delivery centers to handle the e-commerce traffic. The postal department’s revenues by ways of COD consignments from e-commerce majors have more than doubled in the first nine months of fiscal year 2015-16 at ₹10 billion (US$150 million), up from ₹5 billion (US$74 million) during the whole of 2014-15, and just ₹1 billion (US$15 million) in 2013-14. According to the Minister for Communications and Information Technology, Ravi Shankar Prasad, revenue of India Post from such deliveries would go up to ₹15 billion (US$220 million) in the year 2015-16. India Post was embroiled in controversy when a Right to Information query by Satendra Singh of Enabling Unit revealed that a majority of post offices in India's capital city are inaccessible to persons with disabilities. 1 2 Annual Report 2014-15 (PDF) (Report). India Post. Retrieved 20 April 2016. 1 2 3 Annual Report 2011-12 (PDF) (Report). India Post. Retrieved 14 April 2016. ↑ "World's Highest Post Office". Stamps of India. Retrieved 24 April 2011. ↑ Kaul, Chandrika. "From Empire to Independence: The British Raj in India 1858–1947". BBC. Retrieved 3 March 2011. ↑ "The world's highest post office!". Rediff. Retrieved 24 April 2011. ↑ "Srinagar gets floating post office". Times of India. 2 August 2011. Retrieved 7 June 2012. 1 2 Annual Report 2009-09 (PDF) (Report). India Post. Retrieved 14 April 2016. ↑ "Scinde District Dawks". Archived from the original on 27 October 2009. ↑ Alan C. Campbell, "The Design Evolution of the United States Official Stamps", U.S. Philatelic Classics Society Chronicle, Vol. 48, Nos. 1 and 2, Whole Nos. 169 and 170 (February and May,1996). ↑ "Refresher Course". Linns.com. Archived from the original on 25 June 2008. Retrieved 14 April 2016. ↑ Saksena, V. ibid., p. 84. ↑ Saksena, V. (1989), pp. 86–8. ↑ "Revenue of Postal Department". PIB. 19 February 2014. Retrieved 21 February 2014. ↑ "Welcome to the Indiapost Website". Indiapost.gov.in. Archived from the original on 20 May 2012. Retrieved 4 August 2012. ↑ "Do you know the total number of PIN Codes in INDIA?". infoknown.com. ↑ "Do you know the total number of POST Offices in INDIA?". infoknown.com. ↑ "Modernization of India Post". Punjab Kesari. Archived from the original on 15 May 2012. Retrieved 7 June 2012. ↑ "Rs 5000 cr project to computerise India post". The Economic Times. Retrieved 14 April 2016. ↑ Annual Report 2010-2011 (PDF) (Report). India Post. Retrieved 7 October 2012. ↑ "RTI Process gets Further Boost with the Introduction of 'e-Indian Postal Order' for all by the Department of Posts" (Press release). PIB. 13 February 2014. Retrieved 16 February 2014. ↑ "Customer Portal". Postal Life Insurance. Retrieved 7 June 2012. 1 2 3 4 5 "PPF". India Post. Archived from the original on 3 May 2012. Retrieved 14 June 2012. ↑ "Coming soon, Post Bank of India". The Hindu. 23 February 2013. Retrieved 25 February 2013. ↑ "Post Bank" (Press release). Press Information Bureau, Government of India. 14 August 2013. Retrieved 14 August 2013. 1 2 3 "India Post posts profits on e-commerce boom". The Indian Express. 11 January 2016. ↑ "CBS Rollout info" (PDF). www.indiapost.gov.in. ↑ "India Post Sees A Massive 900% Jump In Profit As The Prefered [sic] Partner Of E-Commerce Brands". Indiatimes. 12 January 2016. Retrieved 13 January 2016. ↑ "No ease of access to post offices for disabled". Times Of India. 29 Oct 2012. Retrieved 17 November 2012. ↑ "Many post offices not accessible to disabled, reveals RTI query". The Hindu. 12 Nov 2012. Retrieved 17 November 2012. ↑ Bhalla, Jaya Shroff (2 Dec 2012). "Access denied: Delhi not for disabled". Hindustan Times. Archived from the original on 24 December 2013. Wikimedia Commons has media related to Post of India.